A Legal Heirship Certificate is used to determine heirship or inheritance of property in the absence of a will of a deceased person in many foreign jurisdictions. Legal Heirship Certificates are utilized in a situation where there is no dispute regarding succession of a decedent’s estate. If there is anyone who believes that he or she, too, is a legal heir, the Legal Heirship Certificate will be denied and the appropriate proceedings will be instituted before a court of law. Heirship Certificates are used during the probate process in Greece, Germany, India, Pakistan, Indonesia, and many other countries. For example, in India, a Legal Heirship Certificate is a certificate given by the appropriate village officer declaring who the legal heirs of a person who has passed away are. This type of Heirship Certificate can be issued for the purpose of receiving owed Government payment to the heirs of the decedent and many other areas of inheritance. It is an informal, non-binding certificate and may be challenged in court if a dispute should arise as to heirship of the estate. When employing a Legal Heirship Certificate, the affiant should be certain there are no disputes between the parties who assert claims to the estate of the deceased. 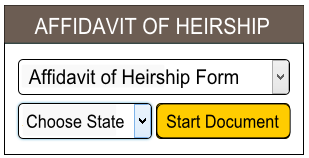 Download a free Affidavit of Heirship form in just five minutes online.